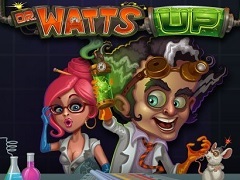 Mad scientists, buxom assistants, a crazy monkey and an out of control robot all feature in the fun, action-packed Dr Watts Up pokie from Microgaming. Cool animations, well presented images and a suitably strange soundtrack give Dr Watts Up plenty of appeal, while having some bonus features like free spins, stacked wild symbols, a pick a prize type game and more, makes this a high quality pokie all round. Looking at the game for the first time, players may notice something missing. There are no payline numbers to the sides of the reels, as this is one of a number of Microgaming pokies that has their ‘243 Ways to Win’ layout. Winning combinations occur when at least 3 adjacent reels, starting from the left side, have the same symbol on them, no matter what positions on those reels they may be in. Like the name suggests, there are 243 different ways that this can happen, but the downside is that anyone wanting to just try the game out with a tiny stake will be out of luck, as all the reels are covered automatically. So the minimum that can be wagered on a spin is 0.30, while increasing the value of the coins, and the number of coins in play equals a maximum bet of 300.00, certainly enough to suit most bankrolls. Decorating the actual reels are some beautifully drawn symbols that wouldn’t look out of place in an animated movie, with jars of dangerous-looking chemical concoctions, another jar with a brain floating in it, a ray gun and a green slug being experimented on making up the lower value icons. Bigger payouts come from lining up the robot, monkey, the lab assistant and our crazed Dr Watts himself, who is the highest paying of the regular symbols, dishing out 50% more than the next most valuable one. The game logo is the wild symbol here, meaning that it will act as any other, except the scatter, to help complete a winning line, while also paying out the biggest prizes of the game if it makes up a line on its own. Another nice symbol to land is the atom, which is a scatter with a couple of special attributes. Firstly, players will win some big payouts when it lands on at least 3 spots, anywhere on the reels, and secondly it will trigger a free spins game, with 3, 4 or 5 of them launching 10, 15 or 20 spins. Just as an extra treat, during the free games a laser gun above the reels will move around, turning whichever reel it stops on completely wild, for improved chances of some nice wins. On top of this, all payouts in the free spins round are multiplied by the total stake that triggered them, not the coin values, so it can be highly rewarding to land these games, even though they can’t be re-triggered. The lab rat will also trigger a bonus game when he lands on reels 1, 3 and 5 at the same time. Players are taken to another part of the lab where they will see a number of test tubes and by picking 2 of them, they will be offered a prize value. But if it doesn’t seem enough, they can turn it down and try again, although the second offer has to be accepted, and it could be less, so choose wisely. What’s up with Dr Watts Up? It’s a good game overall, with an excellent design and rewarding bonus rounds. It’s usual to find a couple of faults with any pokie, but here, there’s really not much to criticise. The 243 Ways to Win system excludes players who want to wager tiny amounts, but it’s always best to cover all lines anyway, so it shouldn’t be a problem. So pokies have wild multipliers, where any win created by the wild substituting for another symbol is multiplied in value, which isn’t the case here, but that’s just me being a bit picky. Having symbols of animals in a lab could be seen as being of questionable taste, although it’s all done with a sense of humour and even the rat in a jar seems happy enough, as will players who try this game out at the many online casinos which carry the Microgaming range.